Here the LNWR meets the Furness Railway. FR 0-6-0 no.119 with LNWR 2-4-2T on local, cattle truck and five 6-wheelers. Two chimneys left beyond the bridge and maybe five more the other side of the line. There is a tank engine almost hidden behind the 2-4-2T, possibly FR '23' Class 0-4-0ST, and a nice junction signal left. Workington/Whitehaven area? I think this is a Whitehaven to Workington train, going the long way round via Rowrah, on the Furness & L&NW joint line at Cleator Moor Junction. This picture is indeed at Cleator Moor Junction. The train is one from Whitehaven to Rowrah/Marron on the Whitehaven, Cleator and Egremont, LNW & FR Joint Line. The junction signal is on the left (with junction behind the camera) with the signals Off for the WC&E line. The route off to the left is the Cleator & Workington Junction Line to Workington. The Furness loco is shunting in the exchange sidings, note the Chaldron wagons - a common feature of freight operations in West Cumberland, with a rather more modern ore hopper wagon next to the engine. The picture was taken from the signal box. In later years there was a main line crossover in the immediate forground. This picture has been published before, when the FR 0-6-0 was noted as being no 119. Does anyone care to suggest a date or period? The picture, which came from the collection of the late Major John Hext, is a single weight sepia print mounted on heavy card. There is no indication of date, but the general appearance suggests early 1900s, say by 1905, or possibly earlier. The wagon next to the FR locomotive appears to be a LNWR Diagram 44 hopper wagon and it looks as if it is labelled for the Cleator District (the lack of coke raves is consistent with this). Also it has diamonds without the 'LNWR' lettering, and no white band round the top plank. 'LNWR Liveries' (1985) records a white top plank on such a wagon in 1909. As an aside, the point work appears to be laid with interlaced sleepers. 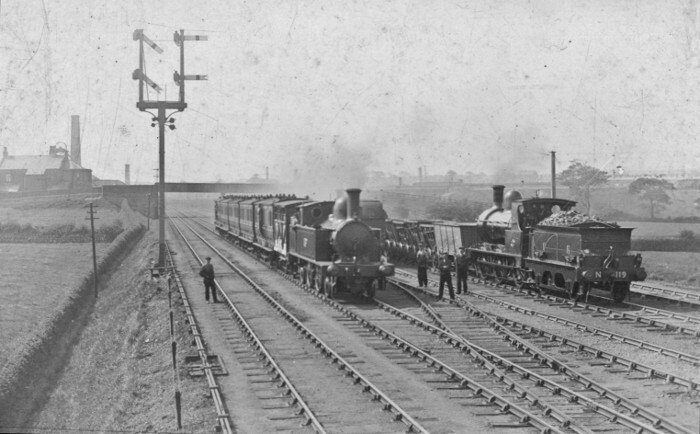 The date is 1899 at the earliest, because the Ordnance plan of that year shows only four tracks, although there is an embanked open space along the west side of the line - on the right in the photo - ready for additional sidings. There are five tracks on the photo, but a sixth was added later, perhaps not long afterwards. I'd guess that circa 1900 wouldn't be far out. The winding-wheel, above and behind the building in the left background, belongs to "Pit No 4". Whether this was for mining coal, or ironstone, and to which group of pits it belonged (Cleator Moor, Moor Row or whatever) I do not know. Perhaps if its dates of operation could be established, they might help to date the photograph more precisely. I've looked at this picture on another computer which gives a much lighter image than mine. On this, the 'No 119' on the FR engine's tender is very clear. It also looks as if the L&NWR engine lacks a lamp-socket in the middle of its bufferbeam. While it is impossible, from the picture on the screen, to be absolutely certain of this, perhaps the original print will be sharper. If there is no central lamp-socket, the date would be before 1903. So the date of the photo would have to be 1899-1902.